In order to commemorate the 450th anniversary since Valletta’s foundation, the Valletta 2018 Foundation will be hosting the Valletta Pageant of the Seas showcasing hundreds of Maltese artisans and their talent in order to display local Maltese talent united under the same effort. The Valletta Pageant of the Seas will take place on the 7th of June, (Sette Giugno) with a programme packed with unique events. A behind-the-scenes look of what’s yet to come. The Grand Harbour, which has played quite a significant part in many of Malta’s greatest historical episodes, will be the heart of many of the activities taking place on the Sette Giugno, along with Senglea and Birgu. In Tellieqa Telliqun, 22 teams have to construct their own makeshift raft and sail from Senglea to Ta’ Liesse in Valletta without the aid of traditional oars or motors. A Regatta race will kick things off at around 6 o’clock as Maltese and Italian rowers take to their boats and go head to head with each other. L-Għawma Toni Bajjada follows soon after. The event is named after the valiant Great Siege hero who swam between Fort St Angelo and Fort St Elmo to deliver messages between the Knights of St John at great peril to his own safety. Keeping in theme with its namesake, the event is a race between hundreds of swimmers crossing the same passage as Toni Bajjada in the Great Siege. To help the swimmers get into the spirit of things, over fifty of the people who also take part in the In Guardia parade will be dressed in 16th century costume holding flags and banners to cheer the swimmers on. The event will be in aid of Puttinu Cares and those interested in participating can enter the race against a donation of 10€ only. All those interested in taking part can sign up here. The Fernandes II, a magnificent two-masted fully rigged ship, will also be in the middle of the Grand Harbour flying the Maltese flag. The Upper Barakka, Senglea and also Fort St Angelo will give it a cannon salute in honour of the port’s history with ships, of war and of merchandise. 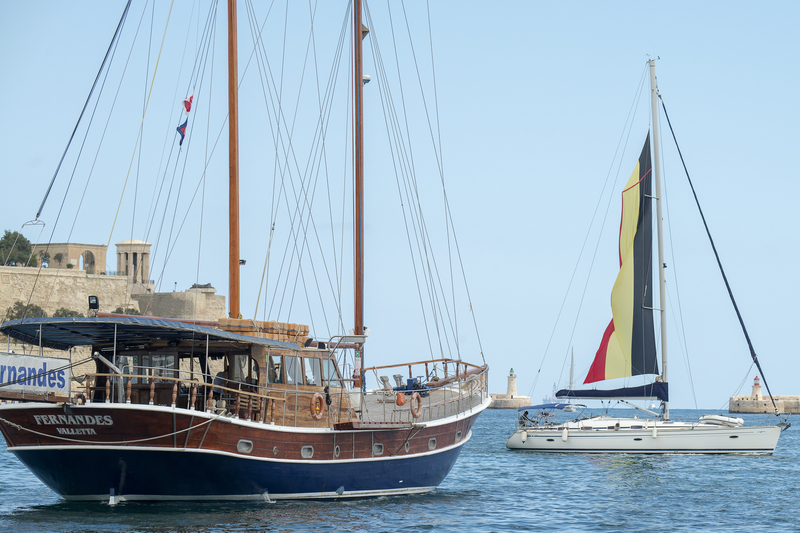 In addition, 27 yachts will sail out to meet the larger vessel to represent the European Union’s eventual involvement with Maltese history. A formation of planes will fly past the ship. To continue adding to this grand spectacle, two carnival floats on barges will join the ship. The first float being the King Carnival float of 2016, and the second being the winner of Section A float by Stephania Gellel. Both floats will be accompanied by their dancers. Ten other smaller floats will be burned at sea to really light up the night. Together, these vessels promise to create an amazing visual tableau of Maltese naval and artisanal tradition. Topping the night off, the UK-based outdoor spectacle company Walk the Plank looks like it’s going to be one of the Pageant’s biggest highlights. Walk the Plank has over twenty years of experience in programming and producing outdoor performance and artworks of the highest quality. Whether they’re creating it, burning it, or making it, they always put on a show to be remembered by audiences all around the world. During the Valletta Pageant of the Seas, they’ll be displaying crazy acrobatic stunts and pyrotechnic performances to keep everyone entertained at all times. If you’re unsure about what you should do with your public holiday on the 7th of June, come down to the Grand Harbour and bring your sea legs with you. Don’t miss out!